Boomerang! You do always come back! I didn't really care for Sokka all that much until the Spirit World episode. Then he became a favorite. "BOOMERANG! You do always come back!" "You could give us food. And money." The recurring joke of them forgetting she's blind kills me to this day. The messenger hawk bit was genius. The timing is spot on. Zuko had funny bits very, very early, and Sokka was more than just comedy very, very early. Well, yeah. He's sixteen. Teenagers lose their sense of humor around the same time they grow armpit hair. That doesn't save him from being unintentionally hilarious, though. I love when he sulks. "I'm never happy", or "I'm angry at myself". Or dear lord, when he tells his girlfriend, "I don't hate you too"? I was on the floor. Poor little emo-Zuko. Nobody understands your pain. I bet Zuko listens to My Chemical Romance non-stop. But only the old stuff, because the new stuff's too corporate. Sokka put Zuko in his place, though. "My girlfriend turned into the moon." This teenage angst thing is an American phenomenon and convention. I know that Avatar is an American product for American audiences, but even that doesn't justify a one-facet character. I'd have liked it a little better if the show portrayed him as a person with more interests than just hunting down the Avatar. I thought that Iroh was a better character for having more faces, despite technically being something of a secondary character. I'm hoping Korra characters won't be as one-dimensional at the start. I don't know if I would call *any* of the main characters one faceted (that is the reason I like the show). Sokka took his sweet time maturing, and yeah -- he annoys me for the entire first season. But he most definitely shows growth and maturation during the series -- as much or more than even Aang. The only one faceted characters I can think of were the supporting casts who were intended to be one faceted -- Iroh, Ozai, and Azula never really changed. If we're tlaking about characters that annoy the pants off me, the reliance on Azula's untempered ruthlessness was a huge turn off. I realize she existed primarily to explain Zuko's difficult internal journey, but...yeesh. Hey, Azula changed in a big way at the end. haha. Yeah -- her losing her mind when she loses -- to a waterbender, no less -- is as telegraphed as Iroh ripping his shirt off to verify his badassery. Still, their inevitability doesn't make their use as plot elements any less cool. Season Two and Season Three Sokka - that's a better character for being better rounded, but Iroh had interesting character detail from the start, and I don't know that you can call him one-faceted at all. That's really more like Aang, who rarely changed from being, well, The Avatar!!! I realize that The Avatar has to uphold that facet of his personality, but I really hope that Korra's more interesting as a person. Sokka grows as a person in the series, and that's one way to keep characters interesting, but Iroh grows as a character, even though he remains pretty much the same person through the series. What this means is that we are treated to more and more of his character as the series progresses. 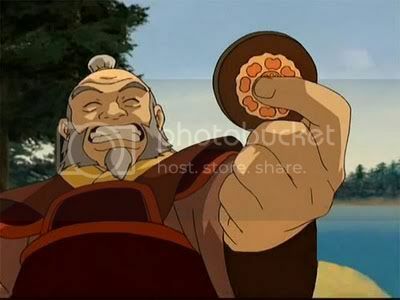 From his point of view, or the POV of someone who knows him well, he's the same person, but the Iroh we know at the conclusion of Fire isn't the same character as the one we knew at the end of Water. I don't want every character to be Iroh, but I would like the same level of thoughtful detail in Korra characters. What's this guy's favorite color? Which dishes does this girl prefer? How is it that a Water Bender is bad at just normal swimming? I particularly detested the one-two-three episode arc that tended to fast-track things that shouldn't be. When Zuko changes his, er, choice of friends, I would have liked for him to have had to earn trust for at least half of a season's worth of episodes, and for each character to have a different way to grant trust. As it went, it felt like a game with a set character quest. Since Korra is coming from a very well-received show, I hope they get the space to weave multiple story arcs through entire seasons this time around. Didn't someone once say Cliches are Cliches for a reason? If not, can it be me? We may be using the words differently, Larry. Aang, Sokka, and Zuko all mature from annoying brats into mature men. The female characters mature from naive and over idealist to matronly and nurturing (Katara) and from angry and violent to purposeful and thoughtful (Toph). That's why I consider them multifaceted. Iroh is just your very standard archetype from beginning to end. Momo shows more character depth than he does. edit - -Tales from Ba Sing Se notwithstanding. I probably missed this but when is this due to premier? Possibly. Aang, Sokka, and Zuko have small added details added to their basic characters that translate into "We've changed as persons," items, but they're still basically the same, somewhat detail-deprived characters. There's a lot of episodes in each season, but there are few episodes that really leave a lasting mark on each character, or gets referred to as an important facet at a later episode. As an example, despite Katara's distaste for blood-bending, and the unpleasant way in which she learned it, she doesn't seem to have as much of an aversion to it later on as we would surmise from the episode that showcased it. Iroh plays about as much of an archetype as the main characters, but he does come with a lot of detail, and updates to his character provide an ongoing improvement, and also cast a different, more interesting perspective on actions he has taken in past episodes. Example: when he teaches Zuko how to redirect lightning, he clarifies that he made the techniques based on principles of water bending. We are not told in detail how in the blue blazes a Fire Nation General would have the inclination to do that, or how he'd get a Water Bender to teach him said principles. When it is revealed that he is a long-time member and current leader of the Order of the White Lotus, all becomes clear. Indeed, we have to wonder if he had that position at the start of the show, and how foresighted he was if he foresaw how great an impact Zuko would have on later events. I too wish to express my affection for the series, yet cannot bring myself to gush. I created an iOS RTS/TD hybrid, Ninja Dino Showdown!? That's really more like Aang, who rarely changed from being, well, The Avatar!!! I realize that The Avatar has to uphold that facet of his personality, but I really hope that Korra's more interesting as a person. Wait... what? Aang changes quite a bit during the course of the show. Indeed, it's kind of the whole point. Aang starts off as this needy, self-absorbed child riddled with doubt and self-loathing and afraid of his own responsibility, and he turns into, well, a f*cking badass. As he develops his power, he develops himself, and learns hard lessons about duty, trust and forgiveness. The entire story is about how Aang grows up. I mean, in the last episodes, he literally invents his own fifth element through sheer force of will (and maybe Lion-Turtle). First Season Aang couldn't have done that. Hell, even Day of Black Sun Aang couldn't have done that. He has to mature enough to be able to even come up with the idea in the first place, much less pull it off. Companies removing trailers from youtube is utterly baffling to me. I agree with everything else you said, but I don't think Aang can be credited with the idea of bending a person's energy. Sure he was looking for an alternative to killing the Firelord, but not only did the lion-turtle tell him about it, it seems likely that the lion-turtle bent Aang's own energies in order to give him that ability. It still took tremendous force of will to actually strip Ozai of his power, though. Eh. I viewed that as kind of a cop-out. It's essentially just a power-upgrade, not a new personality facet. He starts off the show not wanting to kill anyone. In the end, he never does, because Lion-Turtle gives him a way out. Thus, he never has to confront his demons, and he's spared from ever making the hard choice of having to compromise his morals, or having to watch the world burn. In short, he never really owns up to the responsibility he was always afraid of, because being Avatar means never having to make a tough choice. He gets more powerful, that's it. His personality doesn't even change much because of all this added power. That's one way of being a badass, but I'd have preferred it if he had to make the tough call and live with what he did. I wasn't really a fan of the whole energy-bending thing, because it doesn't actually provide a better solution. They still put Ozai in jail forever. Aang already incapacitated him prior to the big energy-bending scene, so they could have just transferred him to a jail cell with his powers intact. As long as they don't stick him in a crappy, poorly-guarded cell like Iroh, the end result would be the same. The way I saw it was that since Avatar was a show primarily geared towards children, Aang's coming-of-age as the full Avatar would be like a child's fantasy of being a grown up: being nearly omnipotent and being able to do what you want to do, not the way we grown-ups generally see ourselves as grown-ups. Since Korra is an teener, I'm hoping that the central development of her character would follow a teener's fantasy of what being grown up is all about. The Lion-Turtle definitely felt like a cop-out, but there were references to him earlier in the series. I felt like the whole series was going back and forth between a kids show and a cartoon for adults, like the creators couldn't make up their mind. The finale to me was the creators choosing what they were actually making, and they chose a kids show. EDIT: "My girlfriend turned into the moon" and "That lemer is earth-bending!" are probably my favorite lines from the series. "Can your science explain why it rains?" That's a starkly different take on the finale than I had. From the very beginning of the series, Aang was told it was either him or Ozai. Either Aang betrayed his conscience and killed the Fire Lord, or he stuck by his principles and died instead. All his friends and mentors told him this, even the former Avatars, even Roku, even Ozai. But Aang never believed it. And it was that hope inside him, that conviction that there must be a better way, that drew the Lion Turtle to him and revealed the third option: mind-bending. Far from a cop-out, I thought it an incredibly elegant solution to the moral dilemma Aang faced, and the only one that makes any sense within the context of the Hero's Journey. It echoes Luke Skywalker's final choice not to kill Vader in Return of the Jedi. Luke knows its either him or Vader. Everyone tells him this, even his best friends, even Vader himself. But Luke knows, in his heart of hearts, there's a third option. IMO, what happens to Ozai after Aang decides to mind-bend him is kind of irrelevant. Nobody cares about Ozai, only about how his presence or power relates to Aang's dilemma. It's like asking what happens to the Ewoks after the Empire falls; at that point, who really gives a crap? Just let Warwick Davis dance around a little and we'll be happy.